At about 6:20 p.m. Friday, Mitchell Joseph Davis allegedly set a confederate flag on fire in the parking lot of a restaurant at 649 Pier Avenue in Oceano. The flag belonged to a Grover Beach woman, and it was attached to the rear of her pickup truck. Witnesses said they saw a person light the corner of the flag on fire and then flee the area on foot. The Grover Beach woman was inside the restaurant at the time, according to the sheriff’s office. Another customer at the restaurant put out the blaze using a pitcher of water. After deputies initially failed to find the suspect, investigators reviewed surveillance footage and managed to produce a description of the man. At about 5 p.m. Saturday, deputies spotted a person matching the description of the suspect walking in the area of Pier Avenue in Oceano. Deputies detained Davis and arrested him on charges of arson, resisting arrest, giving false identification to a peace officer and a civil rights violation. 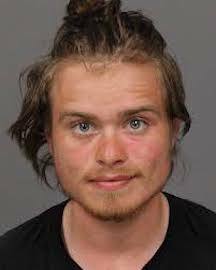 Authorities booked Davis into the SLO County Jail, where he remains with his bail set at $20,000. I’m sure his mother is very proud.